Around the Capitol building there are three main cafeterias within the House and Senate buildings. They are located on the Senate side in the Dirksen Senate Office Building, on the House side in the Longworth House Office Building and in the Capitol Visitor’s Center. All three are open to the public, you will have to go through security to get into the buildings. The cafeterias are used primarily by staff of the House and Senate and can give you a fun taste of life on the inside. The closest metro stop for the cafeterias are Capitol South (House side) or Union Station (Senate side). Union Station is not only a main transportation hub for the metro and Amtrak trains. It is also a beautiful building with multiple restaurant options. There are several sit down restaurants, but the easiest thing with kids may be to head to the basement to the food court where there are plenty of options to satisfy all your family members. You will have to fight your way past Capitol Hill staffers to get a seat here, but it’s a fun Mexican restaurant with lots of energy. Try it for lunch or dinner. This is another popular spot with Capitol Hill staffers. Bullfeathers serves traditional pub food, think hamburgers and tuna melts. Another good lunch or dinner spot. We love Eastern Market! On the weekends it is transformed into a neighborhood street market with outdoor vendors selling amazing artwork and jewelry. There are tons of restaurants to choose from in this area, but our favorite place to eat is inside the market at Market Lunch. They have great hamburgers, NC style BBQ and crab cakes. It is a free for all as far as seating, but there is seating outside when it’s pretty out. Market Lunch is closed on Mondays, but open for breakfast and lunch Tuesday – Saturday and just lunch on Sunday. 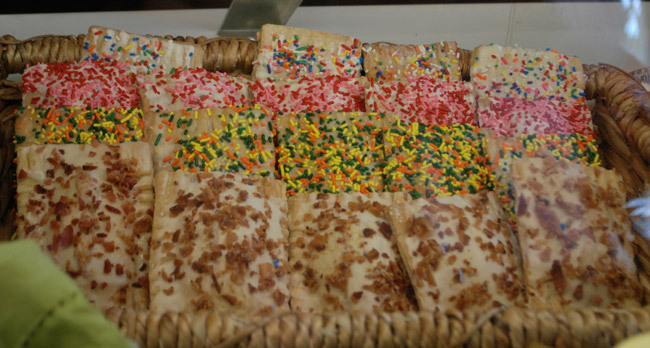 I haven’t found anything I didn’t love and you can grab a homemade pop tart on the way out. It’s super busy on the weekends and there is usually a wait. This is the perfect spot for brunch or lunch. In addition to pizza you’ll also find sandwiches and salads on the menu. It’s a big place so even if there is a line the wait isn’t usually too long. Mathbox Pizza is good for lunch or dinner.